I love talking and waxing philosophical about productivity. Knowing how we work is so essential if we want to create that resonant content we crave – and feel like we are all making a positive difference. But I realized recently that I think a lot about my individual productivity instead of the productivity of the team. 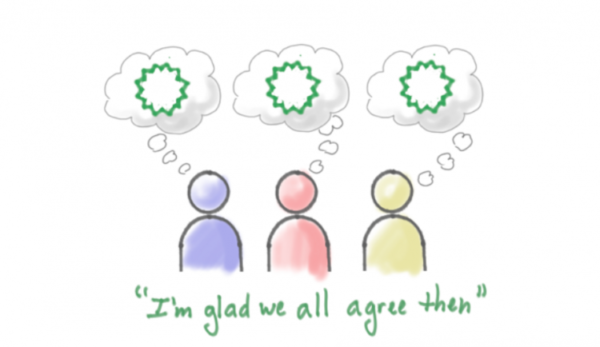 Of course, working together as a team is ridiculously important – and it’s one of the reasons I’m interested in Agile marketing. While individual “tricks” continue to be useful, what does your team need to make sure they are working in the best possible way? This list below is a mix of specific tools as well as more intangible things you need to have so your team can focus on the creation of the work instead of the process behind the work. I realize technologies are missing from this list, but those collaboration and workflow tools will be exceedingly helpful once you have your team and processes. Notice how everything starts with why? It does. And, in this case, your why is your basic strategy for why you are doing the work you are doing and how you are going to measure whether it’s working – or not. How will we know we are successful? (These are the business goals for your strategy.) Note: You also need to understand how you’ll measure success and report back to your team. Not only do successful teams document their content marketing strategy, but they also document their workflows. If you aren’t familiar with workflows, they are the process your content follows and the people who are needed in its creation and production. If you’re constantly asking, “who is doing what,” “what do I do next,” or “why is this taking so long,” chances are you need to dig in to your workflow. Raechel Duplain has a fabulous article on how to do just that. This may sound arduous, but Raechel’s five-step plan walks you through the process. Focusing on the bottleneck allows you to work on improving production processes where improvement is most needed. Any focus on a non-bottleneck task will only bring marginal improvement or no results to the overall system. In fact, it’s likely to create greater waste. Taking the time to identify and break your bottleneck is the key to increasing and attaining your content production goals. And, if you find out that you’re the bottleneck, check out this follow-up post in which Brian shares a case study of how he worked with a CMI reader who was having that very issue. 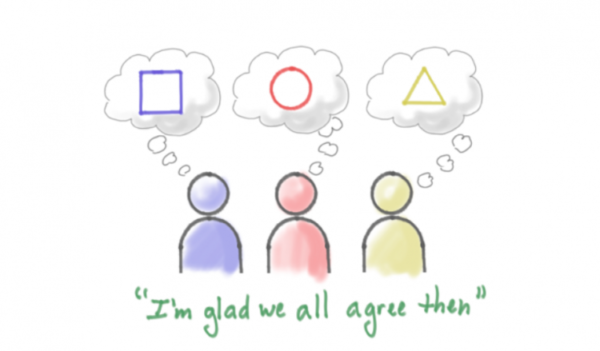 How do you get to a place where everyone is on the same page? My favorite tool to do this is the user story, which I finally understood after attending Andrea Fryrear’s ICC workshop on Agile marketing. Yes, user stories are something Agile teams rely on heavily, but they are useful for any type of team creating content. Below is an example of a user story – and I highly recommend you read the entire post from Andrea to learn about this handy tool. But, in short, user stories are a way for you to document your content ideas so everyone gets closer to that shared understanding. And, then, even better, you can prioritize these stories and knock them out one at a time. 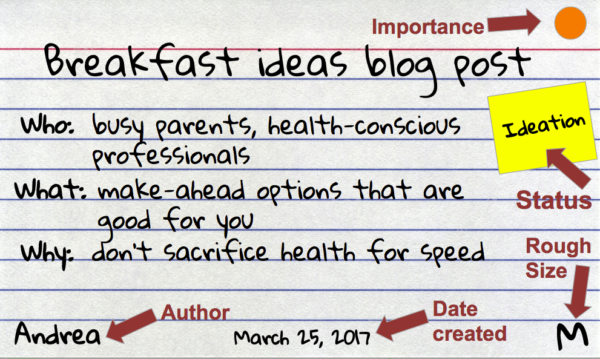 BONUS TIP: Another Agile concept I think is useful is minimum viable content. This was another tool I walked away with during said ICC workshop, but it is a way for you to figure out what type of content you can create by testing an idea with your audience before you invest a bunch of time. Do you ever want to scream because someone on your team – or unrelated to your team – has just one more change (and maybe it’s a big one)? Eva Jackson suggests assigning a problem owner to every single project. This is the person who is not only responsible for the piece, but it’s also the person who has the final say. If your team is not clear on who has the final say in your content projects, sit down with your department and ask one bafflingly simple yet challenging question: Who owns what? Answering that question – and recording your answers for all to see – will create immeasurable accountability. BONUS TIP: Eva also suggests focusing on problems instead of deliverables. This means that the team has a more holistic view of what they are trying to accomplish – what the purpose of their piece is trying to accomplish (see the sections above on your why and user stories) or what issue they are trying to solve (such as increasing the number of the right kind of subscribers). Deliverables aren’t part of the conversation until the purpose is defined. And having a problem owner helps move these cross-departmental projects forward. One exercise I like to use to get people on the same page is to define the three words you want your editorial to encompass. As many of our spaces are crowded, defining these three words helps you differentiate your brand by deciding how you want to say something. Like your editorial mission, these three words serve as a lens to make sure your brand is consistently portrayed. Sasha Laferte details the essentials for a style guide — and offers several examples. OK, now we’re moving from the tangible to strategic practicality, but I think these last two elements are just as important as the others. The distractions of an environment where teams are encouraged to contribute to everything leave little time for the critical thinking that can make a real difference to an organization’s success. If you are leading a team, set a good example and don’t answer email all day (and night) – and don’t always put your team’s needs first (I cringe a bit when I say this). But living in your inbox and on your phone isn’t good for anyone. It can be tough for others to unplug if they don’t see their team leader doing this. Just because you can be available doesn’t mean that you should be. One way to get some much deserved and needed quiet is to set office hours. This is an approach I borrowed from Cal Newport, author of Deep Work. Not only is this a great approach for an individual, but it’s so useful for a team as well. Instead of thinking of any non-meeting time as unscheduled, I now block out chunks of time to write or create presentations. I don’t automatically make myself available — and I encourage others on my team to do the same. BONUS TIP: Another way to turn off distractions is to have established priorities and truly focus on what the team agreed is most important. One way to save time (on stupid projects) is to say no to most of the ad hoc requests that come up. In 30 Habits of Highly Productive Content Teams, Heather Hurst suggests setting up rules so the team deals only with a certain number of ad hoc requests at a time — and let everyone on the team know what that limit is. Status reports – snoozer. While status reports may seem like an unnecessary task, they are key to making sure your team continues to make progress on what you decided to work on. Status reports don’t need to be onerous. A simple report keeps your value front and center, and it lets others on the team reap the benefits of what is working well. As I recently mentioned, I send a monthly update to the CMI team … except for those couple of months when I didn’t. To my surprise, people on the team asked where the reports were. I followed up to ask why these reports are useful and then simplified my format so it was easier for me to create and people received what they wanted. Over to you, titans of teams. 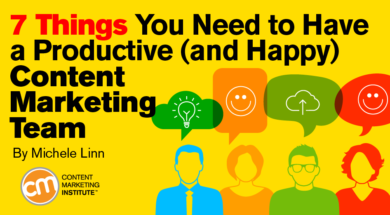 What other things do you think any content marketing team needs to work effectively? A team that learns and plays together stays together – and there is no better place to do this than at Content Marketing World. The best changes happen when entire teams attend, so ask about our group discounts. You can also catch Michele presenting about how to create your ultimate content marketing team. Register today and use code BLOG100 to get $100 off main registration.